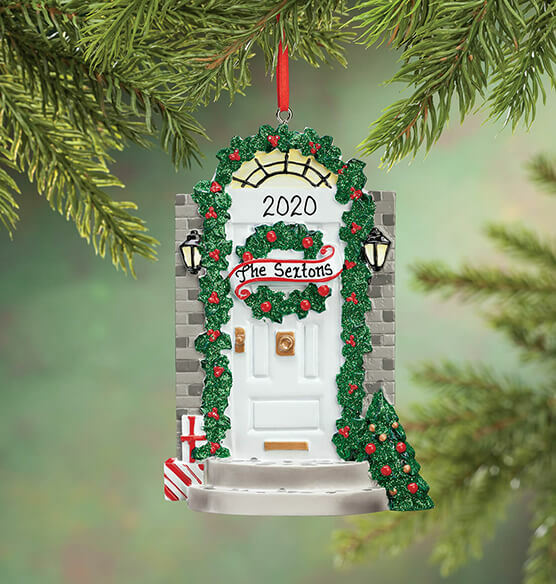 Offering holiday welcome in heartwarming style, this charming personalized front door ornament celebrates simple joys of hearth, home and family. The highlight of this ornament is the white door, which sits at the center and is decorated with a traditional green wreath. Green holly frames the entire door and artful front stoop accents, along with a brick exterior, add realistic charm. Hang this beautiful ornament on your decorative tree to commemorate a wonderful year. It's also a thoughtful way to commemorate a first home or welcome a new neighbor. We'll personalize it with any family name, creating a custom keepsake. Specify name; limit 1 line, 12 letters/spaces. Specify year; limit 4 characters. Made of durable resin. Personalized ornament measures 5" long x 3 1/4" wide. Every thing I've ordered is always wonderful.Only one time did they send me something that was wrong, it otherwise all the things have been just great! Love this door ornament! Personalization is perfect! Very pleased with this as it was well made and colorful. This is a perfect hostess gift, I'm very pleased with the quality. D.H.
Name was spelled wrong on the ornament and I checked the spelling twice before submitting my order... ? ?